MARKETING Blackpool has won a Silver international marketing award. The Destination Management Organisation, responsible for attracting business and leisure tourists to the holiday resort, was shortlisted as a finalist in the Meetings Industry Marketing Awards. At an awards ceremony in London, it won the Silver Award for its Conferences and Meetings guide, beating competition from Austria's Vienna Convention Bureau and the Royal College of Physicians and coming in second place just behind Hackney Venues. 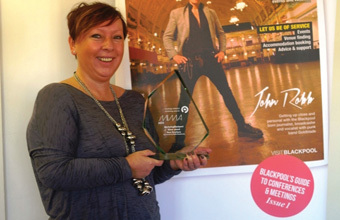 Marketing Blackpool tourism manager Mandy Tythe-McCallum said: "We were absolutely delighted to be shortlisted at the MIMA's so to walk away with Silver is great news. "This year's guide is completely different to anything we have ever done before and that has clearly been recognised. Obviously the guide has to be about venues and facilities but Blackpool has so many contrasts and is such a unique destination that we really wanted this to be evident."